To the North of Merthyr Tydfil lies the Brecon Beacons National Park. Of all the places to visit in Wales, the wildness of these hills have always held a strong attraction for me. The idea of National Parks came to the U.K. from America which boasted the first ever - Yellowstone Park in 1872. However, Britain did not catch on to the idea until 1938 when the Standard Committee for National Parks, (SNCP) was founded. A national park is not land that anybody can have access to just as they wish. Much of it may be owned by farmers and other land-owners. Much of the Brecon Beacons is owned by the National Trust, a charity that was founded in 1895 by the three Victorian philanthropists, Miss Octavia Hill, Canon Hardwicke Rawnsley and Sir Robert Hunter, who were concerned about the effects that industrialization was having on land, buildings and coastlines around the United Kingdom. The Brecon Beacons cover 1,344 sq. kms. (approx 519 sq. miles) and is mostly sparsely populated moorland grazed by ponies and sheep. The park is visited by huge numbers of tourists during the summer with pony trekking and hill walking a common sight. At one time, pony trekking became such a common pastime with tourists and the locals, that many farms devoted most of their resources to it and suspended other more usual farming activities. 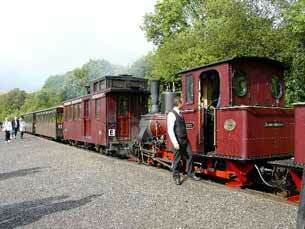 train runs throughout the summer months beginning at Easter time. This is the easiest way to view these remarkable hillsides if hill walking is not your forté. If it is, then you can walk for miles without seeing another human being, but it is advisable to take a map and compass, because the only paths available are those etched out by the sheep, and they are not interested in going anywhere in particular, especially to areas populated by humans! 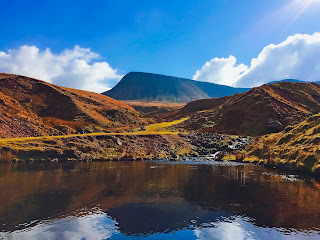 If you like camping there are many sites across the Brecon Beacons. 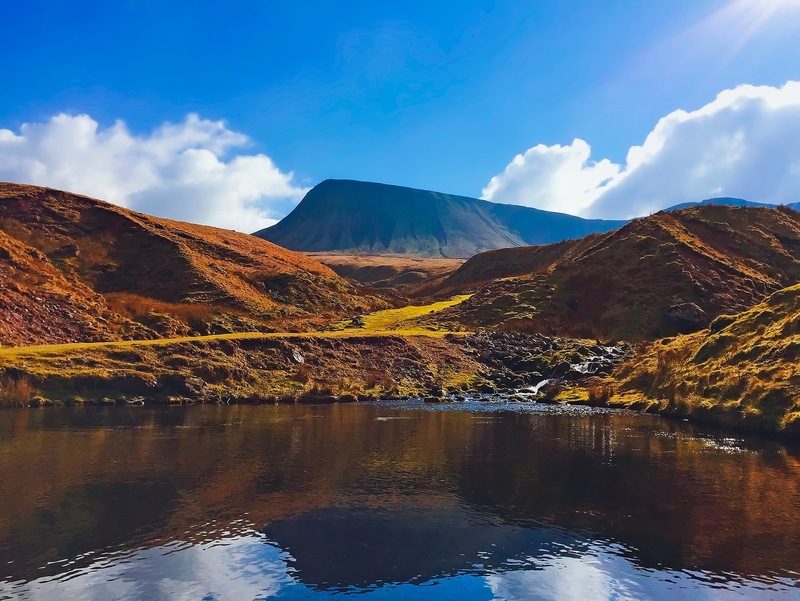 The Brecon Beacons are abundant in wild life, inhabited by foxes, badgers, pole cats, squirrel, and a large variety of birds. On a walk through the wooded parts of the Beacons, if you are fortunate, you will see wild birds such a woodpecker, tree creeper, stock dove and on the moors, buzzards and kites may be seen hovering over their prey. There are many fresh-water lakes with Llangorse Lake being the largest in South Wales, where many birds like great crested grebe, mute swan, sedge warblers and reed buntings can be viewed in the respective seasons. Occasionally one may see many ponies on the Brecon Beacons. However, these animals are not wild, but privately owned Welsh mountain ponies, that are bred for their hardiness and abilities to fend for themselves on the bleak Welsh hills. Because they are hardy, they are cheap and easier to keep than most horses and ponies, and at one time there was a huge market in selling them as children's riding ponies.